Bring the world into your home, family and community by hosting an international high school exchange student. By hosting a student for a few weeks or an academic year, you’ll share cultures and form bonds that last a lifetime. These extraordinary young people from countries all over the world receive a highly competitive, merit-based scholarship from the U.S. Department of State to attend local high schools and live with families in urban, rural, and suburban communities in all 50 states. These exchange students participate in the Congress-Bundestag Youth Exchange (CBYX), Future Leaders Exchange (FLEX), and Youth Exchange and Study (YES) Programs. Once selected, students are expected to maintain a high level of academic performance, learn about American history and society, and to participate in community service. Volunteer host families support exchange students by providing a comfortable, nurturing home, nutritious meals and transportation to and from school activities. To get started as a host family or school, please complete the interest form below and a local coordinator in your area will reach out to you with more information. Each year, almost 2,000 extraordinary young people from around the world receive a highly competitive U.S. Department of State-sponsored scholarship to live with host families and attend high school in the United States. These future leaders participate in the Congress-Bundestag Youth Exchange (CBYX), Future Leaders Exchange (FLEX), and Youth Exchange and Study (YES) programs. Host schools help build diplomatic bridges with other nations by leaving positive, lasting impressions of the United States on their exchange students. 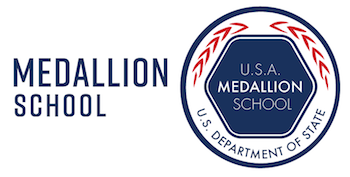 By enrolling a U.S. Department of State-sponsored exchange student, high schools become Medallion Member Schools. These schools set themselves apart by demonstrating a commitment to academic and cultural enrichment for their students through international exchange. Medallion Member Schools may pair the official medallion with their school name and advertise on banners, newsletters, websites, signage, clothing designs, and more. The world is increasingly interconnected. By participating in the Medallion Program, you can prepare your students to become global citizens. Exchange students introduce your students to another culture and increase their international awareness without requiring them to travel. CBYX, FLEX and YES students also positively impact your school through sharing their countries and cultures, engaging in extracurricular activities, and volunteering in their communities. To access the official medallion, please contact your local placement organization.